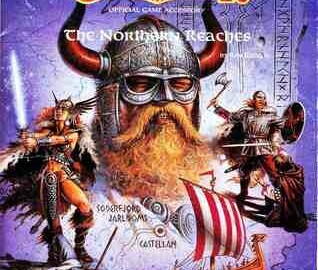 One of the thing about the Northern Reaches is that it had a DM book and a Players Book. I don't have all of them, but if memory serves, this was the only one that had more than one country detailed. I thought about this earlier tonight when I was working on a project. When I was in high school playing my version of D&D, the Gazetteers felt like so much boring reading with no real value. I loved reading them and thinking about the stories that could take place in these various places. The issue was that I didn't feel like I could do the setting justice if I put it into the games I ran. In my defense, I was 16. Still, I'm the same person that played Spelljammer without any 2e books and a mishmash of various editions + Dragon magazines. Why on earth did I get the sudden concern over playing "by the book"? What I enjoy about rulesets and sub-systems is that they are tools to help me play my game. The settings books at that time felt like places to tell a story according to specific constraints. Some of the constraints did not fit into my game, so I tossed out most of it. These days, I see similar books that seem to fit between a setting and a module. Anomalous Subsurface Environment feels like one of them. You're in the future, a city is laid out, there are lots of new creatures and all kinds of new devices. I feel like I could put Denethix in my game. More than that, I could just take out the city and just do the module, even with the lasers and robots. ... we get lots of random tables and adventure hooks rather than pages of historical and cultural information that serve no immediate purpose. So while I am toiling away on a creature book, I begin to see connections between the various monsters. A series of images of giants make me wonder what kind of place would exist to deal with these massive creatures? My brain delighted in thinking about the backstory, history, and all sorts of neat story ideas featuring these giants. Maybe they are descendants of the Greek Titans. Maybe they are servants of evil gods sent to lay waste to the earth. Maybe they found a cache of growth potions. After about an hour, I realized that as much as I wanted to write a Gazetteer type of book to explain these giants (and lots of other creatures), that I was about to create something that the 16 year old me would never use. Read? Oh my, yes, but not for a game. It's true that I can work my way back to random tables and adventure hooks, but I'm in the place now where I want to convey a sense of different without the story getting in the way. In other words, the setting where these giants exist is different, but not so much of a special snowflake setting that they cannot exist somewhere else. No verbiage is wasted on things that will never interface with play. Finally, someone has put to words what I was thinking almost thirty years ago. Slumbering Ursine Dunes has a new class, tax-collectors, magic devices, and a solution to uninteresting elves. There are places to visit that aren't detailed into a series of keyed rooms or hexes. If I were to write a mini-setting, a gazetteer, or interesting hex-crawl, it would look a lot more like S.U.D or A.S.E and less like some of my favorite reading material as a kid. I'd make sure to present the bones of new classes, new monsters, and unique locales to be sure. More important, though, would be a list of adventure hooks as well as a way to generate your own. After all, it is not about my vision for a perfect fantasy setting, it's about evoking possibilities and providing tools to fleshing out those possibilities. Where does this leave me several hours later into working on this project? Two new classes, a handful of new spells, unique creatures, and just enough info to let you know that this isn't just another faux European place. The only jargon I've got so far are the names of the gods, a city name, and a word for a massive giant-killing crossbow. The names of the Gods matter to Clerics because you get three or four extra spells available to you depending on the god you serve. The giant-killing crossbows matter because giant attacks happen more than would normally happen rolling against the encounter table. The names feel a bit Phoenician/Roman/Punic, but creating a character is still rolling 3d6 in order, buying some gear, and walking out of town to seek your fortune. If you want, you can generate a name that sounds Phoenician/Greek/Roman, etc, but if you want Bob the Bold, go for it!